eCITATION® is a wireless mobile application that replaces paper-based traffic citations. 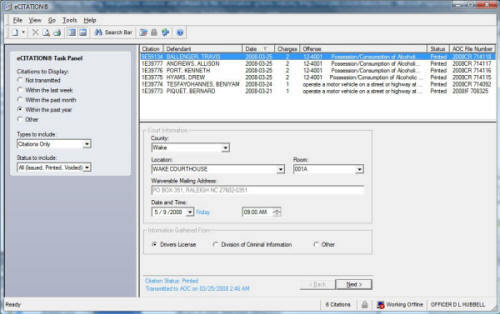 Through extensive, user-friendly features and functions, traffic citations are written on the officer’s laptop or MDT. They can then be immediately transmitted wirelessly to the court system, or can be transmitted in batch electronically at the end of the day, in either case avoiding delays, mistakes and redundant data entry inherent in paper citations. In addition to the time and money savings at the station and courthouse, eCITATION® allows the patrolling officer more time to do his job. Interplat Solutions bid for, and won the contract to write the eCITATION® system for the North Carolina State Highway Patrol. The original pilot software was architected such that counties experienced problems in adjudicating citations because needed data was not available in the courtroom and the software was lacking in essential edits. For example, the application allowed the officer to send a defendant to a courthouse in a county other than where the offense took place and to a courtroom not in the specified courthouse. Also, officers were forced to enter the court date and day of week, without edits being present to confirm that the two were in sync. In addition, the software did not indicate successful or unsuccessful transmission of citation data. Officers did not know if cases had been created successfully after transmitting them to the middle tier software that periodically forwarded citations on to the Administrative Office of the Courts (AOC). As a result, citations were often lost and not accounted for. Since the Highway Patrol would license the application for use by every law enforcement agency in North Carolina, it needed an application that is lightweight, easily deployed, and able to communicate either over the states private network or an SSL-based Internet connection. Interplat's first step was to make better use of existing hardware and Microsoft® Windows™ operating systems by completely rewriting the client application with Microsoft® VisualStudio. The single-tier, proprietary architecture was replaced with Microsoft's component-based, three-tier model. By implementing a solution based on COM, Interplat was able to make use of various third-party components and write the complete application in less than four months. The result was an intuitive, easy to use, single-window application that Windows™ users have come to expect. The data integrity challenges were solved by extensive use of dropdown lists. The items in the lists are filtered appropriately so that an officer does not inadvertently make a bad choice. The use of dropdowns not only solved the data integrity issues, but also greatly minimized the data entry time. Interplat reduced the data entry time even further by implementing the ability for officers to enter defendant information either by scanning the North Carolina drivers license barcode or by getting the information directly from the North Carolina Division of Motor Vehicles. In addition, many of the fields default to the last used values, allowing officers to skip over them entirely. The deployment issue was solved by creating a professional, wizard-style installation that can be run either from a CD-ROM, a network, or the Internet. eCITATION® software is installed on the patrolling officer's laptop or MDT. Paper citation booklets are no longer needed. After entering a citation, the officer may print out a hard copy for the defendant. The citation may then be transmitted wirelessly to the central court repository (AOC in North Carolina), where it maintains its electronic form through adjudication in the courtroom. The system indicates successful and unsuccessful transmissions by either associating the AOC case number with the citation or presenting the officer with an appropriate error message. If errors are encountered, the officer may correct them and retransmit the citation. Data entry errors are again greatly reduced by improved client-side data validation before transmission. "eCITATION® is awesome. It takes me less time to write citations, and I am able to write more as a result. The fact that there is less paper involved is also great. I don't have to mess with 3 copies, and I know once I've transmitted it to the court system that citation is complete." The ability to work "offline" allows officers to continue issuing and printing citations even if the centralized server is down. This also makes for more effective use of the officer's laptop by allowing it and eCITATION® to be used in the courtroom, making witness information and officer notes easily available. Use of eCITATION® results in substantial savings of time and money for law enforcement agencies and court systems. The patrolling officer enters the citation data once, transmits it, and moves on to other duties. Supervisors spend less time in reviewing citation data. And importantly, there is no need for additional data entries by administrative or court personal.